Wolfsburg, in Lower Saxony, located in the northwestern quadrant of Germany, is a bright, low-slung industrial city of 125,000, with the sort of modern look of curvilinear roofs and Cubist glass architecture that qualified as futuristic in the 1950s. The main attraction is a vast, open-air museum dedicated to automobiles, aptly titled the Autostadt, that attracts 2 million visitors a year. The skyline is broken only by four tall, dark- reddish smokestacks. “Wolfsburg” is actually an alias. Once upon a time, the city was called Stadt des KdF-Wagens bei Fallersleben: the “City of the Strength Through Joy Car at Fallersleben,” Fallersleben being the nearest town. The car is better known as the Volkswagen, Adolf Hitler’s “people’s car,” and Wolfsburg is still the company’s headquarters and home of its main factory—the largest single auto factory in the world. These days, Wolfsburg is rightfully wracked with anxiety, as the company is embroiled in a massive scandal over rigging its vehicles’ emissions devices to report less pollution than the cars actually belch. The inescapable conclusion is that Volkswagen housed crooks. About five miles northeast of Wolfsburg lies the village of Rühen. With a population of just 5,000, it’s as small, green, and bucolic as Wolfsburg is sprawling, gray-white, and industrial. It is the quintessence of German quaintness. But this, too, is something of an illusion. Rühen is closely linked to Wolfsburg and to Volkswagen. This calm and pastoral village is the place where Volkswagen’s original sin occurred, the place where it engaged in blood crimes rather than emissions cheating, the place where, almost inconceivably, its executives proved even more reprehensible than the local Nazi Gauleiters. Then and now, no one seemed to care very much what happened in Rühen in the final years of World War II. Volkswagen, for all its alleged postwar rehabilitation, seemed to care least of all, neither acknowledging its guilt over what happened there nor making any effort to provide compensation for the victims. When, in 1999, those victims, now aged, finally filed a class-action suit against the company—a suit that received four brief paragraphs in The New York Times, and that would have received no attention at all were it not for a CBS News investigation—the case was resolved as part of a larger agreement. . 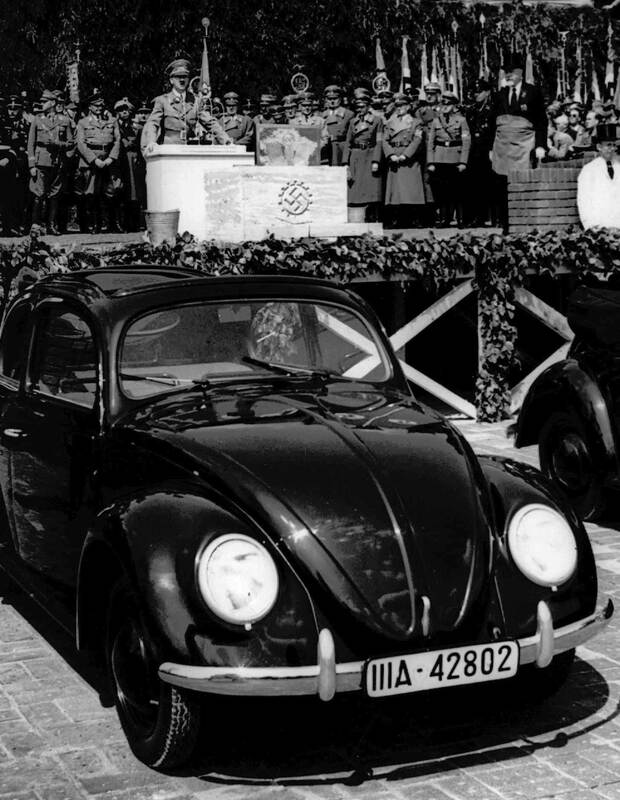 But court records from that suit (which was filed in a US court under international law because the bar for a lawsuit in Germany was too high), as well as the records from an earlier British war-crimes tribunal held in Helmstedt in 1946 that tried several of the company’s employees for “killing by willful neglect,” show that Volkswagen was not innocent. Its executives—not Nazi officials—oversaw the murder of hundreds of infants. Its executives were killers. But there was something else about Wolfsburg that was notable. Because of the scarcity of men as the war dragged on, many of the conscripts were young Polish and Russian women—an estimated 1,500 Poles and 4,000 to 5,000 Russians—whom the Nazis had brought to the factory. The case of Anna Snopczyk was typical. She was only 19 in May 1941, when she and her mother were carried off in a Nazi roundup in her Polish village. “When you walked down the street there, they would catch you,” Snopczyk later told CBS investigative correspondent Roberta Baskin. “They would immediately take you for forced labor.” Eventually, she was sent to the Volkswagen factory in Wolfsburg, where she said that she “worked gluing the bombs.” But Snopczyk developed an allergy to the glue—the Volkswagen foremen wouldn’t let the women wash their hands until the end of the shift—and broke out in eczema, which necessitated transferring her to a farm near the factory. Though she was still a conscript and still technically under the control of Volkswagen, Snopczyk considered the farm an improvement over the factory. While there, she met a young Polish man who worked on a neighboring farm, and they fell in love and made plans to marry. Anna also became pregnant. Volkswagen seemed determined not only to kill the children, but to do so in a way that inflicted grievous suffering. The official company policy was for mothers to spend anywhere from nine to 14 days with their newborns before turning them over to Volkswagen’s custody. In reality, according to court filings, mothers and their children were usually separated after two or three days. Then the mothers would return to work, and they were only permitted to visit their babies thereafter by obtaining a police permit, which was highly restrictive. That’s because the Kinderheim wasn’t a nursery; nor was it warm, comforting, and protective. Instead, it consisted of two primitive, ramshackle wooden barracks with no amenities whatsoever. When Anna visited Józef in the evening, she was horrified. The purpose of the Kinderheim, she realized, was not to save the children but to kill them. And Volkswagen was not simply complicit; the company, not the Nazis, was the perpetrator of the murders. But things were even worse than that. Volkswagen had a decision to make: save the children so that they could one day become slave laborers themselves, or kill them because, as Russians and Poles, they were racially inferior and deserved to die. Once Volkswagen chose the second course, there was still the matter of how the infants would be killed. One Nazi official from the Office for Welfare visited the Kinderheim in the summer of 1943 and wrote to Himmler about what he saw: “The present handling of the problem is appalling, in my opinion.” He cited the inadequate rations allotted to the infants—a half-liter of milk and one and a half sugar cubes per day each—and wrote that “there are ways to handle this without pain and suffering.” But Volkswagen, more cruel than indifferent, seemed determined not only to kill the children, but to do so in a way that inflicted grievous suffering. “The baby was merely tortured,” as one of the laborers who worked in the nursery put it. Anna would later describe the scene she saw when she visited Józef after work. “In the evening, right away, the bugs would show up,” she told Baskin. “Cockroaches, beetles, they all came out. He had a green belly, so they must have added something to the food. When I would leave, he would cry.” Mother after mother complained of the same conditions to the war-crimes investigators. One said that she’d turned her child over to the Kinderheim, “in spite of my being at a loss and in an inconsolable grief,” then went to see him that evening. “I noticed that he was bitten by bugs so badly that his little face was all bloodstained. I couldn’t do anything to relieve the suffering of my child but watch stealthily over him and weep seeing the unlimited misery of those human beings.” One investigator found that each baby had dozens of sores from bug bites; one witness testified that insects crawled over the crying infants all night and that the walls, floors, and beds were “alive” with vermin, bedbugs, flies, and lice. The neglect was everywhere: infants dumped together on beds and bathed 10 to 15 at a time in the same contaminated water, then dried with the same towel; diapers unchanged; windows left open to admit the frigid blasts of winter; sores and infections untended. The stench was unbearable. Not only were the children exposed to insects and cold and infection; they were slowly and systematically being starved to death—“rotting away with each passing day,” as Lammer put it to investigators. The children weren’t fed from 7 pm to 4:30 am—and when they were, the rations were insufficient and often spoiled, the milk too cold for infants to drink. The formula given to babies younger than three months was unpotable. And when a child was too ill to take a bottle, Nurse Pisters, according to testimony, would advise the staff to stop feeding the child and leave it to die. Mothers were understandably panicked. Some tried to smuggle their infants out of the Kinderheim in handbags; one slipped her son out a window. Others tried to breast-feed them, but Schmidt would have them removed from the premises. Even so, all of the mothers were charged “health insurance” to pay for their children’s upkeep. Volkswagen’s crimes might never have been discovered, if not for one bureaucrat who dis­obeyed orders to burn the records. The agony these mothers suffered continued after the deaths of their babies. Anna Snopczyk received the news that 2-month-old Józef had died not from a Volkswagen official, but from the wife of the farmer to whom she was conscripted. Volkswagen then made her pay for the burial. But at least Anna was notified; others learned that their children had died only when they saw a deduction for burial from their small paychecks. “Burial,” too, was a misnomer: The dead infants weren’t really buried. They were wrapped in toilet paper and stacked in the nursery’s bathroom, where they would sometimes lie for days before being carted away by an undertaker, who might bury them together in a large cardboard box or just dump them into a mass grave without a marker. When a mother begged Schmidt to tell her where her child was buried, the head nurse flatly refused. These were the crimes of the medical staff. But one might ask: Did Volkswagen executives know about the appalling neglect and high death rate at the Kinderheim? They knew. Several managers visited the nursery. The factory’s personnel director made inspections and knew of the deaths there. One employee testified to war-crimes investigators that factory director Hans Mayr visited “once or twice”; and Mayr, in his own sworn statement, admitted that he was “responsible for all incidents which [took] place in the plant,” including the nursery. It was impossible for him not to have seen the conditions or known about the deaths. But even with the records and the convictions, attorneys for the victims maintain, Volkswagen’s post-Nazi rehabilitation has never included a public acceptance of responsibility for the deaths at Wolfsburg and Rühen, a proactive effort to compensate the mothers for their loss, an attempt to memorialize the dead children, or even an expression of sympathy. When Anna Snopczyk sued the company on behalf of hundreds of mothers, Volkswagen managed to avoid a trial because the Kinderheim case was folded into a larger agreement on reparations that was negotiated with and paid for by the German government—without Volkswagen’s involvement. In short, Volkswagen never expunged its guilt. It has simply allowed the clock to run, hoping that as the mothers died, no one would be left to remember the company’s horrors. Neal GablerNeal Gabler, a senior fellow at the Norman Lear Center at the University of Southern California, is working on a biography of Edward Kennedy.